The Committee for the Protection of Journalists counts 1304 killed reporters that they know of since 1992. Life-taking as a form of ultimate censorship is being challenged by a new wave of solidarity. "There are crooks everywhere you look now. The situation is desperate." These were the last words Maltese journalist Daphne Caruana Galizia wrote before she was murdered in a car bomb an October afternoon in 2017, as she was rushing to the bank. Her accounts had been frozen, following a plethora of defamation lawsuits triggered by her Running Commentary, a self-published blog she used to expose corruption and express her opinions, often in the harshest of words, about Malta’s ruling networks of interests. Her last entry is also the opening line of Reuters' special report about the journalist and her assassination. When we released the feature, we were not alone: an international team of journalists had been brought together at Forbidden Stories’ round table to continue piecing together her puzzles from where she was forced to leave them. An initiative to protect inconvenient reporting, Forbidden Stories is a non-profit investigative newsroom with a "mission to continue and publish the work of other journalists facing threats, prison, or murder, by organising collaborative investigations", says Rémi Labed, a French investigative journalist and one of the project coordinators. The organisation was founded by Laurent Richard following his 2017 Knight-Wallace Fellowship at the University of Michigan and officially launched in October last year. The idea is to make sure that information on critical topics will reach the public, despite the constraints faced by journalists covering these issues. But it’s "also about sending a powerful signal to enemies of the free press: even if you succeed in stopping a messenger, you will not stop the message", Labed says. The Daphne Project is Forbidden Stories’ first collaborative project. Daphne Caruana Galizia was covering issues of international importance, addressing expensive taxpayers-backed energy contracts or the sell of Maltese passports to politically-exposed persons among allegations of kickbacks for the Maltese political elite. This makes Malta one of Europe’s points of entry, as the country’s checks, controls, and due diligence in handing out passports or banking licenses impacts the EU beyond Malta’s borders. "Her assassination was carried out in a spectacular way, as to send a message. We thought this needed to be responded to, by continuing her investigations in a collaborative manner with other journalists from around the world. 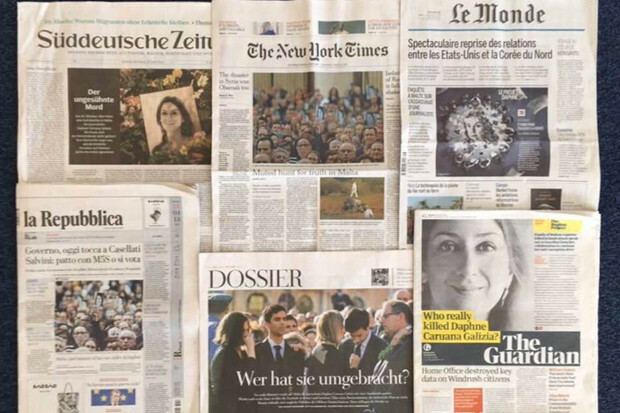 It is both about the importance of the topics that Daphne Caruana Galizia was covering, and about sending a strong signal: her stories will not be silenced. Her death does not mean her stories can’t live," Labed added. In the weeks following the tragic event, the group contacted reporters and news organisations, proposing to join forces to continue her vital investigations and, at the same time, to investigate her assassination. Mid-January, media partners met in Paris to exchange information, brainstorm on Daphne’s stories and nail down how to organise a massive workload. Meeting in person also provided a great motivational boost to last for the following months. "Unlike previous collaborative investigations based on a huge leak that can be broken down in stories of national importance, it was clear that we would all be working the same stories at the same time", Labed said. This required a very high degree of collaboration and information sharing. To exchange notes and documents, a wiki-like platform was set up by the Organized Crime and Corruption Reporting Project (OCCRP), a partner in this initiative. Secure group chats were created to serve for emergencies and discussions. Forbidden Stories coordinated communication, ensuring that all information was shared coherently between members. There were also regular call conferences to organise the reporting. On the ground, collaboration was key as well. The journalists drew up a security protocol to keep everyone involved as safe as possible. They made sure teams of journalists traveling to Malta at the same time got in touch to do interviews, meet sources together, and elaborate on each others' findings. This relayed presence in Malta also ensured uninterrupted contact with sources, and allowed to pool resources, in particular for video and audio recording. Material was then shared with all members of the group. The international group eventually reached 45 journalists and 18 media organisations. "They all turned away from competition for a moment, in order to achieve the best possible reporting, together. This was well understood by everyone in the group", Lambed said. But the main advantage of sharing information, according to him, was revealed when they were hit with complex issues, with ramifications in many countries around the globe. "Having journalists who are familiar with different legislations and contexts, as well as with how information can be obtained really helps. When we were looking for a piece of information, there were always more ideas on how to get it than one of us would have had alone. It multiplies the approaches and the chance of success." The Daphne Project is neither the first nor the only solidarity move that saw journalists exercise some solid cross-border joint reporting muscle. Not too long ago, OCCRP stepped in to continue Khadija Ismayilova’s work, after the Radio Liberty’s Azerbaijani journalist had been imprisoned for asking all the right questions. Ismayilova was unpicking "the corruption of Azerbaijan's ruling family before she was arrested on December 5, 2014 and sentenced to seven and a half years in prison on September 2015", reads The Kadija Project page. She then asked her friends and colleagues to finish her stories before her release. Following relentless watchdog reporting and a press freedom campaign that put political pressure on Azerbaijan, Ismayilova was eventually set free one and a half years later. There’s plenty of need for resistance: we saw it happening again with the murder of Slovak investigative journalist Ján Kuciak just in February this year. He and his fiancée were shot dead in their home. Kuciak was reporting on tax fraud, connecting businessmen and politicians. In 2017 alone, 46 journalists were killed either on a dangerous assignment, caught in a cross-fire, or murdered out right. Suspected sources of perpetrators list government officials and criminal groups among others. Among the victims are six murdered journalists from Mexico. These are in excess of the list read out loud last year, in London, at the Centre for Investigative Journalism’s Summer Conference, when Anabel Hernandez, an investigative reporter and author of Narcoland, started her emotional memorial lecture by reading a list of colleagues who were killed because of their work. All over the globe, cases of violence against journalists who challenge power in the public interest are far too easy to find and they often go unrecorded. Cross-border collaborations have only just begun to disrupt the political and financial pressure some journalists have to face. Crina Boroş is an investigative reporter who combines digital skills with legal knowledge and ​traditional muckraking techniques. She freelances for national and international titles - Reuters, openDemocracy, Computer Weekly - and is part of the Investigate Europe consortium. Crina has been teaching data journalism internationally and has picked up a few distinctions for her reporting. See her portfolio at crinaboros.tumblr.com and get in touch at @CrinaBoros.